The Denver Nuggets are an American professional basketball team based in Denver, Colorado. The Nuggets compete in the National Basketball Association (NBA) as a member club of the league's Western Conference Northwest Division. The team was founded as the Denver Larks in 1967 as a charter franchise of the American Basketball Association (ABA), but changed its name to Rockets before the first season. It changed its name again to the Nuggets in 1974. After the name change, the Nuggets played for the final ABA Championship title in 1976, losing to the New York Nets. The team has had some periods of success, qualifying for the ABA Playoffs for all seasons from 1967 to the 1976 ABA playoffs where it lost in the finals. The team joined the NBA in 1976 after the ABA–NBA merger and qualified for the NBA playoffs in nine consecutive seasons in the 1980s and ten consecutive seasons from 2004 to 2013. However, it has not made an appearance in a championship round since its last year in the ABA. The Nuggets play their home games at Pepsi Center, which they share with the Colorado Avalanche of the National Hockey League (NHL) and the Colorado Mammoth of the National Lacrosse League (NLL). The original Denver Nuggets was founded in the National Basketball League prior to the 1948–49 season. Following that season, the NBL was absorbed into the BAA, which was then renamed to the NBA. The Denver Nuggets played the 1949–50 season as one of the charter NBA teams before folding. In 1967, one of the ABA's charter franchises was awarded to a group in Kansas City, Missouri, headed by Southern Californian businessman James Trindle. However, Trindle was unable to find a suitable arena in the Kansas City area. League commissioner George Mikan suggested moving the team to Denver. After agreeing to name Denver resident and former NBA player Vince Boryla as general manager, Trindle moved his team to Denver as the Denver Larks, named after Colorado's state bird. The Trindle group was severely undercapitalized, leading Mikan to order the Larks to post a $100,000 performance bond or lose the franchise. Hours before the deadline, Trindle sold a ⅔ controlling interest to Denver trucking magnate Bill Ringsby for $350,000. Ringsby then renamed the team the Rockets, after his company's long-haul trucks. Playing at the Denver Auditorium Arena, the Rockets had early successes on the court, developing a solid fan base along the way. However, the team had a history of early playoff exits and failed to play in an ABA championship series. Early, they had a solid lineup led by Byron Beck and Larry Jones, then later by Beck and Ralph Simpson. Lonnie Wright of the American Football League's Denver Broncos signed with the Rockets during that first season and became the first player to play professional football and basketball in the same season. Wright played four seasons with Denver. Controversial rookie Spencer Haywood joined the team for the 1969–70 season. Haywood was one of the first players to turn pro before graduating from college, and the NBA initially refused to let him play in the league. Haywood averaged nearly 30 points and 19.5 rebounds per game in his only ABA season, being named ABA MVP, ABA rookie of the year, as well as the All-Star Game MVP. The team finished 51–33, winning their division, before exiting the playoffs in the 2nd round. Just before the start of the 1970–71 season, Haywood signed with the Seattle SuperSonics, jumping to the NBA. The team tumbled to a 30–54 record and attendance suffered. Ringsby sold the team to San Diego businessmen Frank Goldberg and Bud Fischer in 1972. In 1974, in anticipation of moving into the NBA, and the new McNichols Arena, the franchise held a contest to choose a new team nickname, as "Rockets" was already in use by the Houston Rockets. The winning choice was "Nuggets", in honor of the original Nuggets team in Denver from 1948–50, the last year as a charter member of the NBA. Their new logo was a miner "discovering" an ABA ball. Goldberg and Fischer in turn sold the team to a local investment group in 1976. With the drafting and signing of future hall of fame player David Thompson out of North Carolina State, Marvin Webster and the acquisitions of Dan Issel and Bobby Jones and with Larry Brown coaching, they had their best seasons in team history in their first two seasons as the Nuggets. Playing in the Denver Auditorium Arena for the last season the 1974–75 team went 65–16, including a 40–2 record at home. However, a quick playoff exit followed. In 1975–76, playing at their new arena, the Nuggets edged the reigning champion Kentucky Colonels four games to three to make the 1976 ABA finals for the first time. Eventually, they lost to the New York Nets and Julius Erving. They did not get a second chance to win an ABA league championship, as the ABA–NBA merger took place after the 1975–76 season. The Nuggets, Nets, Indiana Pacers and San Antonio Spurs were merged into the NBA. The Spirits of St. Louis and Kentucky Colonels were disbanded. The Nuggets and Nets had actually applied to join the NBA in 1975, but were forced to stay in the ABA by a court order. The Nuggets continued their strong play early on in the NBA, as they won division titles in their first two seasons in the league, and missed a third by a single game. However, neither of these teams were ultimately successful in the postseason. Similarly to the other new NBA teams, the Nuggets were given many financial issues including a $2 million entry fee. Red McCombs bought the team in 1978. In 1979, Brown left the team, helping usher in a brief decline in their team's performance. It ended in 1981, when they hired Doug Moe as a head coach. Moe brought with him a "motion offense" philosophy, a style of play focusing on attempting to move the ball until someone got open. Moe was also known for not paying as much attention to defense as his colleagues. The offense helped the team become highly competitive. During the 1980s, the Nuggets often scored in excess of 115 points a game, and during the 1981–82 season, they scored at least 100 points in every game. The NBA-record streak was halted at 136 consecutive games. During the 1981–82 season, the Nuggets set the league scoring record for the highest points per game average at 126.5 points. Anchored by scoring machines Alex English and Kiki Vandeweghe at the two forward spots, and Dan Issel at center, Denver led the league in scoring, with English and Vandeweghe both averaging above 25 points per game. It was a novel strategy, allowing the Nuggets to top the Midwest Division and qualify for the playoffs during that span. (On December 13, 1983, the Nuggets and the visiting Detroit Pistons combined for an NBA record 370 points, with Detroit winning in triple overtime, 186–184.) At the end of the season, English won the NBA scoring title, becoming the only Nugget to win the award despite the heavily favored offensive play of Doug Moe. In 1984–85, they made it to the Western Conference finals after being perennial playoff contenders, and they lost in 5 games to the Los Angeles Lakers. Vandeweghe was traded before the 1984–85 season to the Portland Trail Blazers for 6–3 rebounding guard Fat Lever, undersized power forward Calvin Natt and center Wayne Cooper. Spearheaded by Alex English and supported by the three new acquisitions and defensive specialists Bill Hanzlik and TR Dunn, the team replicated its success in the Western Conference despite the loss of Vandeweghe. They even managed to win 54 games in the 1987–88 season, the most they had ever won as an NBA team. However, the Mavericks eliminated the Nuggets in the second round of the 1988 NBA Playoffs. McCombs sold the team to Sidney Shlenker in 1985. Shlenker, in turn, sold the team to COMSAT in 1989. Moe left the team in 1990, and was replaced by Paul Westhead. Westhead also believed in a "run and gun" style of play, and gave the green light for players like Michael Adams and Chris Jackson to light up the scoreboards within seconds of possession. However, Westhead cared even less about defense than Moe. As a result, the Nuggets gave up points so quickly that even their prolific offense could not keep up. They finished with the worst record in the league during the 1990–91 season, despite setting many scoring records. As an insult, many sportswriters nicknamed the team at the time as the "Enver Nuggets" (as in no "D", or no defense). Denver took a positive step in rebuilding by drafting Georgetown University center Dikembe Mutombo in 1991. Mutombo finished runner-up to Larry Johnson for the NBA rookie of the year that season. Denver finished 24–58 that year. Denver fired Westhead prior to the 1992–93 season and hired former star player Dan Issel as his successor. The Nuggets had two lottery picks that year and drafted University of Notre Dame forward LaPhonso Ellis and University of Virginia guard Bryant Stith. Denver improved to 36–46, just missing the playoffs that year. Denver ditched their rainbow colors for a dark navy, metallic gold and wine color scheme starting in the 1993–94 season. Led by Mutombo, Mahmoud Abdul-Rauf (who changed his name from Chris Jackson prior to the season), and Ellis, Denver finished with its first winning season since the Doug Moe era at 42–40. Denver clinched the 8th seed in the Western Conference playoffs, playing the first place Seattle SuperSonics. Denver was a heavy underdog, having only a couple of players on their roster with actual NBA playoff experience. After dropping the first two games of the five-game set in Seattle, the series returned to Denver. Denver won both games and tied the series at 2. The Nuggets made NBA history in Game 5, upsetting Seattle in overtime 98–94. They became the first 8th-seeded team to defeat a 1st-seeded team in NBA playoff history. Denver almost repeated the feat before falling to the Utah Jazz in Game 7 of the second round. Denver acquired Sonics sharp-shooter Dale Ellis in the off-season and drafted University of Michigan guard Jalen Rose. Denver struggled, causing Issel to resign as coach partway into the season. Assistant Coach Gene Littles assumed control for a brief period before relinquishing control to general manager Bernie Bickerstaff. Denver rebounded and earned the 8th seed again in the playoffs, finishing 41–41. The Nuggets were swept by the San Antonio Spurs in the first round of the playoffs that season. Following that season, Denver acquired Antonio McDyess in a draft day trade with the Los Angeles Clippers. McDyess was the face of the franchise for the next few years, as Mutombo left after the 1995–96 season for the Atlanta Hawks, Ellis missed the majority of the next few seasons due to recurring knee and leg injuries, Rose was traded to the Indiana Pacers for Mark Jackson, and Abdul-Rauf was traded to the Sacramento Kings prior to the 1996–97 season. After finishing the 1996–97 season with the fourth worst record in the league (21–61), the Nuggets sent Antonio McDyess to the Phoenix Suns, and Dale Ellis returned to Seattle. Denver flirted with history in the 1997–98, by nearly setting the mark for fewest wins in an 82-game season (11). They tied the then-NBA's all-time worst single-season losing streak at 23—only one game shy of the overall worst mark of 24 by the Cleveland Cavaliers of the early 1980s. The losing streak was later broken by the Cavaliers in 2011 and the Philadelphia 76ers in 2014 with 26 consecutive losses. Several years later, the Nuggets tied for the worst record in the NBA in 2002–03, also with the Cavaliers. The team's struggles in the late 1990s were due in part to ownership instability. COMSAT bought the NHL's Quebec Nordiques in 1995 and moved them to Denver as the Colorado Avalanche. However, its diversification into sports ownership was proving a drain on the company. In particular, cost overruns associated with the construction of Pepsi Center had shareholders up in arms. Finally, in 1997, COMSAT agreed in principle to sell Ascent Entertainment Group, the umbrella corporation for its sporting assets, to Liberty Media. However, Liberty was not interested in sports ownership at the time (though it has since bought the Atlanta Braves), and made the deal contingent upon Ascent selling the Avalanche and Nuggets. After almost two years, Ascent sold the Avalanche and Nuggets to Walmart heirs Bill and Nancy Laurie for $400 million. However, a group of Ascent shareholders sued, claiming that the sale price was several million dollars too low. Ascent then agreed to sell the Avalanche and Nuggets to Denver banking tycoon Donald Sturm for $461 million. However, a new wrinkle appeared when the city of Denver refused to transfer the parcel of land on which Pepsi Center stood unless Sturm promised to keep the Avalanche and Nuggets in Denver for at least 25 years. Sturm had bought the teams in his own name, and the city wanted to protect itself in case Sturm either died or sold the teams before the 25 years ran out. While Sturm was willing to make a long-term commitment to the city, he was not willing to be held responsible if he died or sold the teams. After negotiations fell apart, Liberty bought all of Ascent, but kept the Nuggets and Avalanche on the market. In the meantime, Issel had returned as head coach in 1999, but the protracted ownership negotiations made it difficult for him to rebuild the team. Just before the start of the 1999–2000 season, he told reporters there were several personnel moves he simply could not make due to the unstable ownership situation (since all basketball decisions required the approval of both Ascent/Liberty and Sturm). Finally, in July 2000, the Avalanche, Nuggets and Pepsi Center were bought by real estate entrepreneur Stan Kroenke in a $450 million deal. Kroenke is the brother-in-law of the Lauries; his wife Ann is Nancy Laurie's sister. Liberty retained only a 6.5% stake of the sports franchises. As part of the deal, Kroenke placed the teams into a trust that would ensure the teams will stay in Denver until at least 2025. After the deal, Kroenke organized his sports assets under Kroenke Sports Enterprises. In 2003, the Nuggets drafted future All-Star Carmelo Anthony with the third overall pick in the 2003 NBA draft. That same year, the team also updated their logos and uniforms, with a new color scheme of powder blue, gold and royal blue; the latter color was changed to navy blue in 2008. In just two months of the season, the Nuggets recorded more wins than they had in 5½ months of play in 2002–03. Much of the reason for this incredible turnaround were the front-office moves of General Manager Kiki Vandeweghe, a former Nuggets player who assumed General Manager duties on August 9, 2001. In April, the turnaround was complete as they became the first franchise in NBA history to qualify for the postseason following a sub-20-win campaign the previous year since the NBA went to an 82-game schedule. They were eliminated in the first round 4 games to 1 by the Minnesota Timberwolves. On December 28, 2004, head coach Jeff Bzdelik was fired from the organization and replaced by interim coach, former Los Angeles Lakers player and Los Angeles Sparks head coach Michael Cooper. The Nuggets later hired George Karl as a permanent replacement. Karl led the team to a record of 32–8 in the second half of the regular season, which vaulted the team into the playoffs for the second consecutive year. In the playoffs, however, the Nuggets could not survive the San Antonio Spurs. After winning game one in San Antonio, the Nuggets proceeded to lose the next four games and lost the series 4–1. The Nuggets picked 20th in the 2005 NBA draft; it was acquired from the Washington Wizards via the Orlando Magic. Denver selected Julius Hodge with the pick. The Nuggets also had the 22nd overall selection in the draft, in which they selected Jarrett Jack, but sent him to the Portland Trail Blazers for rights to Portland's 27th overall pick, Linas Kleiza. In 2005–06, for the first time in 18 years, the club won the Northwest division title. This placed the team in the third seed of the Western Conference playoffs. Denver played the Los Angeles Clippers who, despite their 6th seeding, had a better regular-season record. As a result, the Clippers received home court advantage. They defeated the Nuggets in 5 games. Shortly after, the Nuggets announced that General Manager Kiki Vandeweghe's contract would not be renewed. He was replaced by Mark Warkentien. On December 18, 2006, team co-captain Carmelo Anthony, shooting guard J. R. Smith and power forward Nenê were suspended by the NBA (15, 10 and one games respectively) for a fight that occurred in the last two minutes of a game against the New York Knicks two days earlier. The fight was sparked by Knicks rookie Mardy Collins, when he tackled J. R. Smith on a breakaway layup. According to Anthony, Knicks coach Isiah Thomas warned him to not go in the paint shortly before the hard foul. On December 19, 2006, the Nuggets traded Joe Smith, Andre Miller and two first-round draft picks of the 2007 NBA draft to the Philadelphia 76ers for Ivan McFarlin and superstar Allen Iverson (McFarlin was waived immediately following the trade's approval). The moves gave the Nuggets the top two scorers in the league at the time in Anthony and Iverson, who were both scoring over 30 points per game at the time of the trade. On January 11, 2007, Earl Boykins, Julius Hodge and cash considerations were traded to the Milwaukee Bucks, in exchange for point guard Steve Blake. With Iverson, many considered the Nuggets as one of the elite in the West. However, chemistry was an issue, as the Nuggets finished the season with the 6 seed, giving them a first round matchup against the San Antonio Spurs. In the playoffs, the Nuggets took Game 1 and home court advantage away from the Spurs. However, as had occurred in the 2005 playoffs, the Spurs bounced back to sweep the next four, as the Nuggets were eliminated in the first round in five games for the fourth straight year. They finished the 2007–08 NBA season with exactly 50 wins as well as finishing the first half of that season 25–16 (50–32 overall record, tied for the third-best all-time Nuggets record since the team officially joined the NBA in 1976), following a 120–111 home victory over the Memphis Grizzlies in the last game of the season. It was the first time since the 1987–88 NBA season that the Nuggets finished with at least 50 wins in a season. Denver ended up as the 8th seed in the Western Conference of the 2008 NBA Playoffs, and their 50 wins marked the highest win total for an 8th seed in NBA history. It also meant that for the first time in NBA history, all eight playoff seeds in a Conference had at least 50 wins. The Nuggets faced the top-seeded Los Angeles Lakers (57–25) in the first round. The seven games separating the Nuggets and the Lakers overall records is the closest margin between an eighth seed and a top seed since the NBA went to a 16-team playoff format in 1983–84. However, the Lakers swept them in four games, marking the second time in NBA history that a 50-win team was swept in a best-of-seven playoff series in the first round. It was Denver's fifth straight first-round loss. On July 16, 2008, at the end of the 2007–08 NBA season, the Nuggets traded former NBA Defensive Player of the Year Marcus Camby to the Los Angeles Clippers for a second-round draft pick (that was then traded to the New York Knicks for Renaldo Balkman). This trade was to reduce the Nuggets' payroll costs. On November 3, 2008, guard Allen Iverson was traded to the Detroit Pistons for Chauncey Billups, Antonio McDyess, and Cheikh Samb (part of the trade exception from the Marcus Camby trade was used to allow the deal to go through). McDyess was waived though on November 10, 2008, and he returned to Detroit shortly afterwards. With Carmelo Anthony averaging 22.8 points per game and Billups averaging 6.4 assists in the 2008–09 NBA season the Nuggets accomplished a great number of franchise milestones. Their 54–28 record matched the most wins the franchise had gotten since their induction in the NBA; their 27–14 start was also a record for wins in the first half of a season. This also marked the first time in the franchise's history the team had back-to-back 50-win seasons. They led the Northwest division for much of the season, eventually winning the division and placing #2 in the Western Conference, matching the highest the team has ever been seeded for the playoffs. General Manager Mark Warkentien won the NBA Executive of the Year Award for the Nuggets' improvement. They won Game 1 of the playoffs in a blowout victory against the New Orleans Hornets, the first time they had home-court advantage since 1988 and also, the 29-point victory was the largest victory for any team for Game 1 of the first round of the 2009 NBA Playoffs. Chauncey Billups set a Nuggets franchise record with the most three-pointers in a playoff game with 8, and his 19 three-pointers in total is also a Nuggets record for threes made in a playoff series. They went on to beat the Hornets in 5, including a 58-point victory in Game 4 which matched the most lopsided win in NBA playoff history. They then went on to beat the 6th seed Dallas Mavericks 4 games to 1 in the Conference Semifinals to make their first trip to the Western Conference Finals since 1985. That was also the first time the Nuggets had ever led 3–0 in a best-of-seven series. Up to that point, they held an NBA Playoffs-high in three-pointers made and a 16-point average margin of victory, the largest average margin of victory in the first 10 playoff games in NBA Playoff history. They lost the first game of the Western Conference Finals against the Los Angeles Lakers but won the second game to tie the series. Anthony became the first Denver player to score at least 30 points in five consecutive playoff games since the Nuggets joined the NBA in 1976. They lost the series 4–2, ending Denver's longest playoff run in team history. In the 2009 NBA draft, the Nuggets traded a first-round draft pick acquired from the Charlotte Bobcats to the Minnesota Timberwolves for the rights to rookie Ty Lawson, who was drafted 18th overall. On July 13, 2009, the Nuggets traded a second-round draft pick to the Detroit Pistons for Arron Afflalo (part of the trade exception from the Iverson trade was used to allow the deal to go through) and Walter Sharpe. Afflalo replaced starting guard Dahntay Jones, who signed with the Indiana Pacers. However, on August 10, the Nuggets lost forward Linas Kleiza, who signed with Olympiacos Piraeus of the Greek League. The 2009–10 season saw Anthony average 28.2 points per game and Billups average a career-high 19.6 points per game. In the opening two games of the season, Anthony totaled 71 points, scoring 30 points in the home opener and 41 the next night, in wins against division rivals Utah Jazz and Portland Trail Blazers, respectively. Anthony became one of two players in the Nuggets' history to open with more than 70 points through two games (Alex English also accomplished the feat). It was also only the second time since 1987 that the Nuggets started the season 2–0. They later went 3–0, 4–0, and 5–0 for the first time since 1985 after defeating the Memphis Grizzlies, Indiana Pacers, and New Jersey Nets respectively. Despite injuries which caused all three captains – Carmelo Anthony, Chauncey Billups, and Kenyon Martin – to miss a total of 46 games, and then later on in the second half of the season the absence of head coach George Karl, who underwent treatment for neck and throat cancer, the Nuggets were still able to win 53 games (third consecutive 50-win season, a Nuggets first) for the season which gave them a second consecutive Northwest division title and finished as the fourth seed in the West Conference. However, they were eliminated by the Utah Jazz 4–2, their sixth first-round elimination in 7 seasons. Anthony averaged a career-high 30.7 points per game in the playoffs. On July 14, 2010, the Nuggets bolstered their frontcourt depth by signing Al Harrington. During the 2010 off-season, Masai Ujiri replaced Mark Warkentien as the General Manager, while Josh Kroenke was named team president. Stan Kroenke bought full ownership in the then-St. Louis Rams of the NFL in 2010. Since the NFL does not allow its owners to hold majority control of major-league teams in other NFL cities, Kroenke turned over day-to-day control of the Nuggets and Avalanche to Josh Kroenke toward the end of 2010, and transferred his controlling interest in both teams to his wife in 2015. On February 22, 2011, after months of speculation that he wanted to leave the Nuggets, Carmelo Anthony was traded along with Chauncey Billups, Anthony Carter, Shelden Williams and Renaldo Balkman to the New York Knicks in a multi-player deal also involving the Minnesota Timberwolves in which the Nuggets received Wilson Chandler, Raymond Felton, Danilo Gallinari, Timofey Mozgov and Kosta Koufos. On the day when the trade was done, the Nuggets were left with 9 players to play against the Memphis Grizzlies. The Nuggets won 120–107, where they led by as many as 27 points. In the closing minutes of the game, the arena resounded with chants of "Who needs Melo?" George Karl said after the game, "Our guys, when their backs are confronted with a difficult situation, they usually play at a high level. We always react to tough situations in a very positive way." Some people said after the trade the Nuggets would become the "Cleveland Cavaliers" of the West, that is, falter in the standings and lose their playoff hopes due to the loss of their franchise player, Carmelo. However, the trade only seemed to make them better. Post-trade, the Nuggets averaged 24.1 assists, showing their newfound teamwork. The defense of the Nuggets also improved, from allowing 105.2 points per game before the trade to 97.1 points per game for the remainder of the season. Despite the franchise changing trade which saw eighteen different starting lineups through the whole season, Denver finished with 50 wins (fourth consecutive 50 win seasons for the first time in Nuggets history), clinching the 5th seed of the Western Conference. They met the Oklahoma City Thunder in the first round of the playoffs and lost four games to one. The first full season of the post-Melo Nuggets saw the steady rise of Danilo Gallinari, who averaged 17 points, 5.2 rebounds and 2.6 assists through the first 25 games of the season, which resulted to the Nuggets' best start through the first 20 games. But Gallinari was robbed off his best season by injuries to his ankle, thumb, and wrist. On March 15, 2012, the Nuggets decided to make their team younger by trading Nenê, who had played the previous 9 seasons for Denver, to the Washington Wizards for JaVale McGee. In his first game as a Nugget, McGee made a putback dunk off an Arron Afflalo miss which proved to be the game-winning basket in Denver's 116–115 victory over the Detroit Pistons. In two of the Nuggets final games of their season, McGee finally earned national attention when he had a 16-point,15-rebound effort, and a 21-point, 14-rebound effort in Denver's playoff series against the Los Angeles Lakers. These performances helped the Nuggets come back from a 2–0 and a 3–1 series deficit, but the Nuggets eventually lost in Game 7, 87–96. On August 10, 2012, Denver was involved in a four-team trade where they received All-Star Andre Iguodala and sent Arron Afflalo and Al Harrington to the Orlando Magic. This same trade also sent Dwight Howard to the Los Angeles Lakers. After the trade, Iguodala tweeted "I'm excited to be joining the Denver Nuggets and I know my best basketball is ahead of me!" Despite losing their first three games, the 2012–2013 Nuggets finished with a franchise best 57–25 record, and a 38–3 record in Pepsi Center (the Washington Wizards, Miami Heat, and Minnesota Timberwolves were the only 3 visitors to defeat Denver on their home during the regular season). Denver also clinched the 3rd seed in the Western Conference, with a first round matchup with the Golden State Warriors. The Nuggets won Game 1 97–95 on their home court on a last second Andre Miller game winner, but the Warriors won the next three games, putting the Nuggets on the brink of elimination. Denver won Game 5 at home to keep their season alive, but the Warriors eliminated the Nuggets in Game 6, winning 88–92 in Oakland. It was Denver's ninth first round loss in the previous 10 seasons, and the eighth of Karl's tenure. Although Karl won that year's NBA Coach of the Year Award and had led Denver to the playoffs in every year of his nine-year tenure, it was not enough to keep him from being fired after the season. Along with Karl being fired, Denver saw a major shake-up in the front office with Executive of the Year Masai Ujiri accepting the general manager position with the Toronto Raptors and vice-president Pete D'Alessandro, who was expected to replace Ujiri, being named General Manager of the Sacramento Kings. On June 21, 2013, Tim Connelly was announced as the new general manager. and to replace Karl, the Nuggets hired the Indiana Pacers' associate head coach, former NBA player, Brian Shaw. Guard-forward Andre Iguodala was sent to the Golden State Warriors in a sign-and-trade in which they acquired guard Randy Foye from the Utah Jazz. They also signed center-forward JJ Hickson, who was previously with the Portland Trail Blazers and 5' 9" guard Nate Robinson, who played for the Bulls during the 2012–2013 season. They also acquired Darrell Arthur from the Memphis Grizzlies and 55th pick Joffrey Lauvergne in return for Kosta Koufos. In a tough 2013–14 season which saw numerous injuries to key players missing a significant amount of the season, the Nuggets finished with 36 wins, their worst in 11 years, and missed the playoffs. During the 2014 offseason, the Nuggets brought back Arron Afflalo who they traded Evan Fournier for. Denver also traded their first lottery pick (#11) since 2003 to Chicago to acquire two later first round draft picks, which were used to draft Jusuf Nurkić and Gary Harris. On March 3, 2015 general manager Tim Connelly announced the Nuggets fired head coach Brian Shaw and named Melvin Hunt interim head coach. On June 15, 2015, at the end of the 2014–15 season, Michael Malone was named as the new head coach of the Denver Nuggets. Entering the 2015 NBA draft with their lowest draft pick (#7) since 2003, the Nuggets drafted Emmanuel Mudiay who was widely regarded as the top point guard of the draft, leading to speculation that current starting point guard, Ty Lawson, would be traded. On July 14, 2015, Lawson was arrested in Los Angeles on suspicion of driving under the influence, his second in six months. The Nuggets traded Lawson a week later to the Houston Rockets along with a second round draft pick for Joey Dorsey, Nick Johnson, Kostas Papanikolaou, Pablo Prigioni (all of whom were waived), and a first round pick that was used to draft Juan Hernangómez. Under Michael Malone's leadership, the Denver Nuggets slightly started to improve while primarily relying on the youth movement consisting of Emmanuel Mudiay, Nikola Jokić, Gary Harris and later also on the recovered Jusuf Nurkić. On January 27, 2016, it was announced that both Mudiay and Jokić would participate in BBVA Compass Rising Stars Challenge during NBA All-Star 2016. On February 18, the Denver Nuggets announced that they decided to trade veteran shooting guard Randy Foye to Oklahoma City Thunder in exchance for D. J. Augustin, Steve Novak and two second round draft picks. One day later, JJ Hickson and the newly acquired Novak were waived. Over the course of the 2016 NBA draft, the Denver Nuggets added the Kentucky guard Jamal Murray as well as Juan Hernangómez, Malik Beasley, and Petr Cornelie. Meanwhile, their 56th pick was traded to the Oklahoma City Thunder. The Nuggets have displayed numerous color schemes, logos and uniforms throughout their franchise history, including their days in the American Basketball Association (ABA) as the "Denver Rockets." From 1967–68 through 1970–71, the Denver Rockets' logos, uniforms and colors were black, orange and white. From 1971–72 through 1973–74, the Rockets wore gold and purple (Columbine blue) uniforms, and their logo featured a cartoonish rocket bouncing a gold and purple basketball, with a purple and white snow-capped mountain in the background. During the Nuggets' final two seasons in the ABA, the team's logo featured a cartoonish miner known as "Maxie The Miner," with a large red beard, a pick axe in one hand and a red and blue basketball in the other hand. When the Nuggets joined the NBA in the 1976–77 season, they retained the pick-axe logo on their jerseys from the ABA days. The home uniforms feature "Nuggets" in red, with a red pick-axe inside a blue oval, and gold numbers with blue trim in front, blue numbers and letters at the back. The road uniforms were blue, with "Denver" in blue with a blue pick-axe in a red oval, and gold numbers in front, white numbers and letters at the back. The Nuggets simplified their uniforms following their inaugural season in the NBA. From 1977–82, their home uniforms were white, with a "Nuggets" script written across the chest in a darker royal blue, with gold trim around the script and jersey numbers. The royal blue away jersey had "Denver" written across the chest in white, with gold trim. From 1981–82 through 1992–93, the Nuggets wore the Denver "rainbow city" skyline across the chest and back on both the home and away uniforms. Some fans also call the iconic 1980s logo the "Tetris" logo, due to the buildings that shadow the mountains on the logo which are in the shape of squares. The initial home uniforms were white with navy and green trim, with "Nuggets" and the uniform number in gold with blue trim. The player names were written in block lettering and in a straight position. In 1985, they changed the shade of blue to royal and eliminated green, and in 1986, changed the back numbers to royal blue. In 1991, coinciding with the debut of Dikembe Mutombo, the word "Nuggets" became white with royal blue and gold trim. The road uniforms were initially navy blue with green trim, with "Denver" and the uniform number in white with gold trim, before likewise changing it to royal blue, with gold serifed block letters for player names in an arch (royal blue in home uniforms). The font and “Skyline” logo have been used on alternate jerseys to this day, with it being on the Nuggets’ “Statement” uniforms. For the 1993–94 season, the Nuggets drastically changed their look, with a navy blue, metallic gold and wine color scheme on their uniforms. 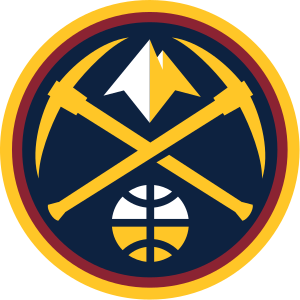 The "rainbow city skyline," which had been synonymous with the team since 1981, was replaced with a logo that featured a navy blue snow-capped mountain above an enlarged western-style "Nuggets" wordmark in metallic gold, and a curved dark red ribbon with a "Denver" wordmark positioned in between the mountain and the "Nuggets" wordmark. The home jerseys had a "Nuggets" script in a modified version of the typeface Aachen across the chest in navy blue, with dark red and metallic gold trim around the script and numbers, while the navy blue away jerseys had the same script in metallic gold, with dark red and white trim. The Nuggets wore these uniforms for a decade, until the end of the 2002–03 season. For the 2003–04 season, the Nuggets made another uniform change, coinciding with Carmelo Anthony's debut, with a color scheme of powder blue, gold (yellow) and royal blue. The primary logo, featuring a snow-capped mountain, curved ribbon with a "Denver" wordmark and an enlarged western-style "Nuggets" workmark (see previous section), was modified, with the snow-capped mountain royal blue, the ribbon powder blue and the "Nuggets" wordmark a golden yellow. Like the 1990s uniforms, the Nuggets' revised jerseys also had the Aachen typeface across the chest — it was "Nuggets" in powder blue, with royal blue and gold trim on the home white jersey, while the powder blue road jerseys had "Denver" in white, with gold and royal blue trim. These jerseys, along with the team logo, were tweaked prior to the 2008–09 season, with the royal blue replaced by the shade of navy blue that had been part of the team's color scheme from 1993–2003. These jerseys were used until the 2014–15 season, while the snow-capped mountain logo would serve as the team's primary logo until the 2017–18 season. In the 2005–06 season, the Nuggets also introduced an alternate logo, as well as an alternate navy blue uniform. The alternate logo featured twin intersecting gold pick axes in a powder blue circle, with a "gold nugget" at the top of the circle and a basketball with gold outlining and navy blue accents. The navy blue jersey featured an alternate "Nuggets" script in gold, with navy blue interior trim and powder blue outlining. This uniform was used until the end of the 2011–12 season, while the circular "pick axe" logo would become the team's new primary logo for the 2018–19 season — see next section. For the 2012–13 season, the Nuggets unveiled a gold alternate jersey, replacing the aforementioned navy blue jerseys that had been used during the previous seven seasons. This jersey featured a return to the Denver "rainbow skyline" logo, but used the team's "Aachen" typeface and color scheme of powder blue, navy and gold. For the 2015–16 season, the Nuggets modified the script and numbering fonts on their home and away jerseys, with a gold "Nuggets" script on the home white jersey and a gold "Denver" script on the powder blue away jersey — both with the "Coliseum" typeface. Navy blue numerals trimmed in gold, as well as navy blue nameplates, were featured on both the home and away jerseys. The alternate gold "skyline" jerseys were also tweaked, with a retro "Nuggets" wordmark (that was used on the 1980s rainbow skyline jerseys) in navy blue trimmed in white. The numerals were also modified with the Coliseum typeface, but remained white, with powder blue interior trim and navy blue exterior outlining. The Nuggets updated their uniforms for the 2017–18 season. The light uniform (dubbed by Nike as the "Association" jersey), the dark uniform (dubbed by Nike as the "Icon" jersey) and the alternate uniform (dubbed by Nike as the "Statement" jersey) saw the return of navy blue as a primary color for the first time since the 2002–03 season, while powder blue was relegated to trim color status. Slight tweaks were made to the striping and lettering. The Nuggets' gold "Statement" jersey made some noticeable alterations as well, relegating the navy, powder and white rainbow to the sides and relocating the number to the bottom. Western Union became the team's jersey sponsor. For the 2018–19 season, the Nuggets modified their logos and uniforms, featuring various color schemes that the team has worn in their history. The new color scheme consists of midnight blue (navy), sunshine yellow, flatirons red (maroon) and skyline blue (royal) — the latter color is only featured on the "Statement" jersey and two of the team's new alternate logos. Powder blue, which had been part of the team's color scheme since 2003, was eliminated from all logos and uniforms. The white "Association" jersey features "Nuggets" in flatirons red, with sunshine yellow trim and midnight blue numbers with sunshine yellow trim, while the midnight blue "Icon" jersey features "Denver" in sunshine yellow, with flatirons red trim and white numbers with flatirons red trim. Both sets will also include a mountain peak striping on the shorts and the pick axe logo on the waistline. The skyline blue "Statement" jersey features "Mile High City" in white surrounding sunshine yellow numbers, plus a midnight blue mountain peak silhouette and a sunshine yellow pick axe logo on the sides of the shorts. A modernized version of the skyline logo adorns the waistline. The circular "pick axe logo," which had served as the Nuggets' alternate logo since 2005, became the team's new primary logo, replacing the snow-capped mountain/enlarged western-style wordmark logo that had served as the team's primary logo (in three different versions) since 1993. The colors on the circular pick axe logo were also modified with the team's new color scheme. In the 2017–18 season, Nike released a fourth uniform option known as the "City" series, which is updated annually. The Nuggets' first "City" uniform has a navy base, highlighting the pick-axe and mountain logo in front and incorporating sublimated mountain peak patterns on the shorts. The Nuggets' 2018–19 "City" uniform was a callback to the team's 1982–93 rainbow uniforms, featuring a sublimated pattern of the rainbow logo and navy lettering. The Nuggets hold the draft rights to the following unsigned draft picks who have been playing outside the NBA. A drafted player, either an international draftee or a college draftee who is not signed by the team that drafted him, is allowed to sign with any non-NBA teams. In this case, the team retains the player's draft rights in the NBA until one year after the player's contract with the non-NBA team ends. This list includes draft rights that were acquired from trades with other teams. 1 Number represents his total number of regular season victories. 1 He also coached the Nuggets in 1992–1994 and 1999–2001. 2 In total, McLendon was inducted into the Hall of Fame three times – as contributor, as coach and as a member of the 1957–1959 Tennessee A&I teams. ^ "NBA.com/Stats–Denver Nuggets seasons". Stats.NBA.com. NBA Media Ventures, LLC. Retrieved October 17, 2015. ^ "Nuggets Brand Identity Evolution" (PDF). Nuggets.com. NBA Media Ventures, LLC. June 6, 2018. Retrieved October 14, 2018. ^ "Evolve". Nuggets.com. NBA Media Ventures, LLC. June 6, 2018. Archived from the original on June 7, 2018. Retrieved February 28, 2019. ^ "Denver Nuggets Reproduction and Usage Guideline Sheet". NBA Properties, Inc. Retrieved June 7, 2018. ^ "Denver Nuggets and Western Union Announce Multi-Year Sponsorship in the Mile High City". Nuggets.com (Press release). NBA Media Ventures, LLC. July 31, 2017. Retrieved December 17, 2017. ^ "Denver Nuggets Promote Tim Connelly and Arturas Karnisovas". Nuggets.com. NBA Media Ventures, LLC. Retrieved June 15, 2017. ^ Harden, Mark (October 7, 2015). "NFL owners let Kroenke keep Rams; transfer Nuggets, Avalanche to his wife". Denver Business Journal. Retrieved October 16, 2015. ^ "December to Remember". NBA.com. NBA Media Ventures, LLC. December 3, 2014. Archived from the original on December 4, 2014. Retrieved June 21, 2016. ^ "Nuggets Nickname History". NBA.com. NBA Media Ventures, LLC. Retrieved June 21, 2016. ^ a b c "Denver Nuggets Franchise Index". Basketball Reference. ^ "ABA-era team notes". Remembertheaba.com. Archived from the original on March 20, 2012. Retrieved May 18, 2012. ^ a b c "Denver Rockets/Nuggets Year-by-Year Notes". Remember the ABA. Archived from the original on April 26, 2013. Retrieved March 22, 2013. ^ a b "Denver Rockets". Remember the ABA. Retrieved March 22, 2013. ^ "Spirits of St. Louis". Remember the ABA. Archived from the original on May 9, 2013. Retrieved March 22, 2013. ^ "Team Records: Offense" (PDF). 2017-18 Official National Basketball Association Guide. NBA Media Ventures, LLC. October 30, 2017. Retrieved June 11, 2018. ^ Graser, Marc. "Liberty Media buys Ascent". Variety. Variety. Retrieved February 25, 2019. ^ Schley, Stewart. Stan Kroenke's full-court press. Colorado Biz, June 1, 2006. ^ a b Moore, Paula. Why one deal went smoothly. Denver Business Journal, July 17, 2000. ^ Nuggets roster moves put on hold. ESPN, November 11, 1999. ^ "Denver ecstatic to get Anthony with third pick". CNN. Retrieved May 1, 2010. ^ "Going Retro: Denver Nuggets". NBA.com. NBA Media Ventures, LLC. December 2, 2004. Retrieved August 9, 2017. ^ a b Lopez, Aaron (August 22, 2014). "Denver Nuggets A to Z: Kiki Vandeweghe". NBA.com. NBA Media Ventures, LLC. Retrieved June 11, 2018. ^ Target Center, Minneapolis (April 30, 2004). "ESPN – Denver vs. Minnesota – Recap – April 30, 2004". Sports.espn.go.com. Retrieved May 18, 2012. ^ "BASKETBALL; Slumping Nuggets Fire Their Coach". The New York Times. December 29, 2004. Retrieved May 1, 2010. ^ "Nuggets Hire Karl to Right the Ship". Los Angeles Times. January 28, 2005. Retrieved June 6, 2010. ^ "George Karl". NBA.com. NBA Media Ventures, LLC. Retrieved June 11, 2018. ^ Deseret News Publishing Co. (May 5, 2005). "Spurs oust Denver in 5 games." ^ a b "NUGGETS: 2005 Draft Central". NBA.com. NBA Media Ventures, LLC. April 20, 2012. Retrieved May 18, 2012. ^ "Nuggets 110, Trail Blazers 98 – NBA – Yahoo! Sports". Yahoo! Sports. April 11, 2006. Archived from the original on October 26, 2012. Retrieved May 18, 2012. ^ STAPLES Center, Los Angeles (May 1, 2006). "ESPN – Denver VS. Los Angeles – Recap – May 01, 2006". Sports.espn.go.com. Retrieved May 18, 2012. ^ "ESPN – Denver vs. New York – Recap – December 16, 2006". Sports.espn.go.com. December 16, 2006. Retrieved May 18, 2012. ^ "ESPN – Suspensions total 47 games from Knicks-Nuggets fight – NBA". Sports.espn.go.com. December 20, 2006. Retrieved May 18, 2012. ^ Marc Stein (December 17, 2006). "ESPN – Answering the hard questions after Garden brawl – NBA". Sports.espn.go.com. Retrieved May 18, 2012. ^ a b Pepsi Center, Denver (March 16, 2008). "ESPN – Seattle vs. Denver – Recap – March 16, 2008". Sports.espn.go.com. Retrieved May 18, 2012. ^ a b c d Pepsi Center, Denver (April 16, 2008). "ESPN – Memphis vs. Denver – Recap – April 16, 2008". Sports.espn.go.com. Retrieved May 18, 2012. ^ "Nuggets Put Up a Fight, but Lakers Get Sweep". NBA.com. NBA Media Ventures, LLC. April 29, 2008. Retrieved June 11, 2018. ^ "NBA – 2004 Playoffs Memphis Grizzlies vs. San Antonio Spurs – Yahoo! Sports". Yahoo! Sports. April 20, 2011. Retrieved May 18, 2012. ^ "Denver Nuggets on Yahoo! Sports - News, Scores, Standings, Rumors, Fantasy Games". Yahoo! Sports. November 10, 2009. Retrieved April 27, 2010. ^ Chris Dempsey The Denver Post (July 14, 2009). "Nuggets' deal for Afflalo fills Jones' role". The Denver Post. Retrieved April 27, 2010. ^ "NBA free agents: Denver Nuggets forward Linas Kleiza takes Olympiakos' offer - ESPN". Sports.espn.go.com. August 11, 2009. Retrieved April 27, 2010. ^ Hochman, Benjamin (October 31, 2009). "Nuggets' Carmelo Anthony, armed with a new mind-set, is off to sizzling start for 2–0 Denver". The Denver Post. Retrieved April 27, 2010. ^ Chris Tomasson %BloggerTitle% (July 14, 2010). "Al Harrington Heading to Denver for Five-Year Deal". Nba.fanhouse.com. Retrieved May 18, 2012. ^ "Stan Kroenke is new Rams owner". ESPN.com. August 26, 2010. Retrieved January 26, 2017. ^ "NFL owners let Kroenke keep Rams; transfer Nuggets, Avalanche to his wife". 9news.com. October 8, 2015. Retrieved January 26, 2017. ^ Hochman, Benjamin; Dempsey, Chris (February 21, 2011). "Carmelo Anthony traded to New York Knicks in blockbuster deal". Denver Post. ^ "WIZARDS ACQUIRE NENE FROM DENVER". NBA.com. Turner Sports Interactive, Inc. March 15, 2012. Retrieved March 17, 2012. ^ "Sources: Dwight Howard to Lakers". ESPN. Retrieved August 10, 2012. ^ "Toronto Raptors introduce Masai Ujiri as the club's new general manager". Mississauga.com. June 4, 2013. Retrieved August 1, 2018. ^ "Brian Shaw introduced as Nuggets coach; "I love this roster", he says". Denver Post. ^ "Kings hire Nuggets VP Pete D'Alessandro as general manager". Sports.yahoo.com. Retrieved August 1, 2018. ^ "Nuggets fire Shaw, name Hunt interim coach". Espn.go.com. Retrieved August 1, 2018. ^ "Nuggets name Michael Malone new head coach". NBA.com. Turner Sports Interactive, Inc. June 15, 2015. Retrieved June 15, 2015. ^ "Ty Lawson, blowing smoke after Nuggets draft Emmanuel Mudiay: 'I'm going to Sacramento, bro'". Sports.yahoo.com. Retrieved August 1, 2018. ^ Ley, Tom (July 14, 2015). "Ty Lawson Arrested For DUI For Second Time In Six Months". Deadspin. Gawker Media. Retrieved July 14, 2015. ^ "Rockets Acquire Ty Lawson and Second-Round Pick from Denver". NBA.com. July 20, 2015. Retrieved July 20, 2015. ^ "Emmanuel Mudiay and Nikola Jokić Named to Rising Stars Challenge World Team". NBA.com. January 27, 2016. Retrieved February 19, 2016. ^ "Nuggets Acquire D.J. Augustin, Steve Novak, Second Round Picks and Cash Consideration". NBA.com. February 18, 2016. Retrieved February 19, 2016. ^ "Nuggets Waive J.J. Hickson and Steve Novak". NBA.com. February 19, 2016. Retrieved February 20, 2016. ^ "Denver Nuggets Select Murray, Hernangomez and Beasley in First Round of 2016 NBA Draft". NBA.com. June 24, 2016. Retrieved July 5, 2016. ^ "Denver Rockets". Remember the ABA. Retrieved January 27, 2013. ^ "Remembering the ABA: Denver Rockets". June 8, 2018. Retrieved June 8, 2018. ^ dbier (October 1, 2012). "Nuggets Unveil New Alternate "Skyline" Jerseys". NBA.com. NBA Media Ventures, LLC. Archived from the original on October 4, 2012. Retrieved June 11, 2018. ^ Lukas, Paul (May 13, 2015). "Uni changes coming to numerous teams in 2015-16". ESPN. Retrieved May 13, 2015. ^ Dempsey, Christopher (August 8, 2017). "A New Era of Nuggets Basketball Gets a Fresh New Look". NBA.com. NBA Media Ventures, LLC. Retrieved June 11, 2018. ^ Kosmider, Nick (August 8, 2017). "Nuggets begin golden anniversary celebration by unveiling new uniforms". The Denver Post. Retrieved August 8, 2017. ^ "Denver Nuggets unveil new look". NBA.com (Press release). NBA Media Ventures, LLC. June 6, 2018. Retrieved June 8, 2018. ^ Dempsey, Christopher (June 6, 2018). "Evolve: Nuggets Usher in a New Era with Reimagined Logos, Uniforms". Nuggets.com. NBA Media Ventures, LLC. Retrieved October 14, 2018. ^ "Denver Nuggets City Edition Uniform (2017–18)". Denver Nuggets. December 18, 2017. Retrieved November 1, 2018. ^ "Denver Nuggets City Edition Jerseys (2018–19)". NBA.com (Press release). NBA Media Ventures, LLC. November 1, 2018. Retrieved November 1, 2018. ^ "Denver Nuggets acquire Trey Lyles, Tyler Lydon from Utah Jazz". NBA.com. June 23, 2017. Retrieved April 21, 2018. ^ "Denver Nuggets Select Murray, Hernangomez and Beasley in First Round of 2016 NBA Draft". NBA.com. June 24, 2016. Retrieved October 13, 2016. ^ "Denver Nuggets Select Emmanuel Mudiay with the Seventh Overall Selection of the 2015 NBA Draft". NBA.com. June 25, 2015. Retrieved June 26, 2015. ^ "Denver Nuggets draft 19-year-old guard out of France". NBA.com. June 28, 2012. Retrieved April 14, 2014. ^ "Draft Rights Held Players". HoopsRumors.com. January 26, 2015. Retrieved July 20, 2015. ^ "McGrady, Self, Lobo headline 2017 HOF class". Espn.com. Retrieved August 1, 2018. The 2009 NBA playoffs was the postseason tournament of the National Basketball Association's 2008–09 season. The tournament concluded with the Western Conference champion Los Angeles Lakers defeating the Eastern Conference champion Orlando Magic 4 games to 1 in the NBA Finals. Kobe Bryant was named NBA Finals MVP. The Boston Celtics lost a best-of-7 series after leading 3–2 for the first time to the Magic in the Eastern Conference Semifinals. Before that, their first round series with the Chicago Bulls set an NBA Playoff record for the most overtime games (4) and periods (7) played. The Houston Rockets won a first round series for the first time since 1997. They pushed the eventual champion Lakers to a Game 7 before losing. The Atlanta Hawks won a first round series for the first time since 1999, but were swept by the Cavs after enduring a tough 7-game series with the Miami Heat, who made the playoffs for the fifth time in 6 years. The Denver Nuggets won a playoff series for the first time since 1994, eventually reaching their first conference final since 1985. As for the Detroit Pistons and San Antonio Spurs, they failed to advance past the first round for the first time since 2000. The Pistons were swept by the Cavs, while the Spurs lost to the Dallas Mavericks 4-1. The Portland Trail Blazers made the playoffs for the first time since 2003, but for the fourth straight time, they were eliminated in the first round, courtesy of Houston in 6 games. The Cleveland Cavaliers became only the second team in NBA History (after the Miami Heat) to go 8-0 through the first two rounds by sweeping the Detroit Pistons and Atlanta Hawks (they would duplicate this feat in 2016, against the same two teams). However, they fell in 6 games to the Orlando Magic in the Eastern Conference Finals. The 2018–19 Denver Nuggets season is the 43rd season of the franchise in the National Basketball Association (NBA). The team revealed a new logo for the 2018–19 season. With a win against the Boston Celtics on March 18, the Nuggets clinched a playoff spot for the first time since the 2012–13 season. In the playoffs, the Nuggets will face the San Antonio Spurs in the First Round. Ann Walton Kroenke (born December 18, 1948) is an heiress to the Walmart fortune. Kroenke and her sister, Nancy Walton Laurie, inherited stock from her father, Bud Walton (died 1995), who was the brother and an early business partner of Walmart founder Sam Walton. She is the owner of the Denver Nuggets of the NBA and Colorado Avalanche of the NHL.Her husband, Stan Kroenke, is the majority owner of the Los Angeles Rams (NFL), Arsenal (English Premier League), Colorado Rapids (Major League Soccer), and Colorado Mammoth (National Lacrosse League). Daniel Paul Issel (born October 25, 1948) is an American retired Naismith Memorial Basketball Hall of Fame professional basketball player and coach. An outstanding collegian at the University of Kentucky, he was twice named an All American en route to a still school record 25.7 points per game. The American Basketball Association Rookie of the Year in 1971, he was a six-time ABA All-Star and one-time NBA All-Star. A prolific scorer, Issel remains the all-time leading scorer at the University of Kentucky and second all time for the NBA's Denver Nuggets and the American Basketball Association itself . Upon his retirement from the NBA in 1985, only Wilt Chamberlain, Kareem Abdul-Jabbar and Julius Erving had scored more professional points. The Denver Nuggets were a professional basketball team based in Denver, Colorado. The Nuggets joined the National Basketball League (NBL) for the 1948–49 season, and then joined the National Basketball Association when the NBL was absorbed by the Basketball Association of America to create the NBA for the 1949–50 season. The Nuggets were the first major professional sports franchise in Colorado, and the first NBA franchise west of the Mississippi. In 1950, the Nuggets were one of seven teams, including Anderson Packers, Chicago Stags, Sheboygan Red Skins, St. Louis Bombers, Washington Capitols, Waterloo Hawks, that dropped out of the National Basketball Association altogether.The Nuggets started the 1949–50 season with a record of 0–15, and finished the season 11–51. Evan Mehdi Fournier (born 29 October 1992) is a French professional basketball player for the Orlando Magic of the National Basketball Association (NBA). He played junior basketball at the French INSEP academy from 2007 to 2009. Jamal Murray (born February 23, 1997) is a Canadian professional basketball player for the Denver Nuggets of the National Basketball Association (NBA). He played one season of college basketball for the Kentucky Wildcats before being drafted by the Nuggets with the seventh overall pick in the 2016 NBA draft. Juan Alberto "Juancho" Hernangómez Geuer (born September 28, 1995) is a Spanish professional basketball player for the Denver Nuggets of the National Basketball Association (NBA). He previously played for Estudiantes of the Liga ACB, and has represented the senior Spanish national basketball team. Kenneth Bernard Faried Lewis (born November 19, 1989) is an American professional basketball player for the Houston Rockets of the National Basketball Association (NBA). He played center at Morehead State University, where he was named Ohio Valley Conference Player of the Year twice and an All-American in 2011. The Denver Nuggets are an American professional basketball team based in Denver, Colorado. They play in the Northwest Division of the Western Conference in the National Basketball Association (NBA). The Nuggets were founded as the Denver Rockets of the American Basketball Association (ABA) in 1967. In 1974, in anticipation of moving to the NBA, the franchise held a contest to choose a new trademarked name for the team, as Rockets was already in use by the Houston Rockets and the name Nuggets won. In 1976, the ABA folded, and the NBA decided to admit four ABA teams into the league, including the Nuggets, the San Antonio Spurs, the Indiana Pacers and the New York Nets.There have been 20 head coaches for the Nuggets franchise. The franchise's first head coach was Bob Bass, who led the team to the division semifinals, losing to the New Orleans Buccaneers. Doug Moe won the NBA Coach of the Year Award for the 1987–88 season. Moe is the franchise's all-time leader in both regular season and playoff games coached and wins. Larry Brown is the only Nuggets coach to be inducted into the Basketball Hall of Fame, although John McLendon was inducted as a contributor, but not a coach. In 1976, Brown coached the Nuggets to the team's only ABA championship game. John McLendon, Joe Belmont, Donnie Walsh, Dan Issel, Bill Hanzlik, Mike Evans, Jeff Bzdelik, Michael Cooper, and Brian Shaw spent their entire NBA coaching careers with the Nuggets.George Karl coached the Nuggets until he was fired by GM Masai Ujiri on June 2013. After the 2013 NBA Finals, Brian Shaw was hired by Denver Nuggets to be their head coach. This is a list of seasons completed by the Denver Nuggets of the National Basketball Association (NBA). They have played for 49 seasons, 38 in the NBA and nine in the American Basketball Association (ABA). As of the close of the 2017 season, they have never reached an NBA Finals and only been to three Western Conference Finals series. Michael Malone (born September 15, 1971) is an American professional basketball coach who is the head coach of the Denver Nuggets in the National Basketball Association (NBA). Michael Lamar Porter Jr. (born June 29, 1998) is an American professional basketball player for the Denver Nuggets of the National Basketball Association (NBA). He played college basketball at the University of Missouri. Porter was ranked as one of the top prospects in the class of 2017. He was selected 14th overall by the Nuggets in the 2018 NBA draft. Nathaniel Cornelius Robinson (born May 31, 1984) is an American professional basketball player for Homenetmen Beirut of the Lebanese Basketball League. Born in Seattle, Robinson played college basketball for the University of Washington in Seattle and was the 21st pick in the 2005 NBA draft. The 5′9″ point guard has also played for the New York Knicks, Boston Celtics, Oklahoma City Thunder, Golden State Warriors, Chicago Bulls, and Denver Nuggets. Robinson is the NBA's first three-time slam dunk champion. In 2018 he plays BIG3 basketball for Tri-State and AFFL flag football for Holdat concurrently, until Holdat was eliminated in the Semi Finals of the AFFL. Nicholas Aaron Young (born June 1, 1985), nicknamed "Swaggy P", is an American professional basketball player who last played for the Denver Nuggets of the National Basketball Association (NBA). He plays both shooting guard and small forward positions. Young played college basketball for the USC Trojans and was a two-time first-team all-conference selection in the Pac-10. He was selected by the Washington Wizards in the first round of the 2007 NBA draft with the 16th overall pick. He won an NBA championship with the Golden State Warriors in 2018. Nikola Jokić (Serbian Cyrillic: Никола Јокић; born February 19, 1995) is a Serbian professional basketball player for the Denver Nuggets of the National Basketball Association (NBA). He also represents the Serbian national basketball team internationally. Standing at 7 ft 0 in (2.13 m), he plays at the center position. He was selected with the 41st overall pick by the Denver Nuggets in the 2014 NBA draft. He received his first All-Star selection in 2019. The Northwest Division is one of the three divisions in the Western Conference of the National Basketball Association (NBA). The division consists of five teams: the Denver Nuggets, the Minnesota Timberwolves, the Oklahoma City Thunder, the Portland Trail Blazers and the Utah Jazz. The division was created at the start of the 2004–05 season, when the league expanded from 29 to 30 teams with the addition of the Charlotte Bobcats. The league realigned itself into three divisions in each conference. The Northwest Division began with five inaugural members: the Nuggets, the Timberwolves, the Trail Blazers, the Seattle SuperSonics and the Jazz. The Trail Blazers and SuperSonics joined from the Pacific Division, while the Nuggets, the Timberwolves and Jazz joined from the now-defunct Midwest Division. The SuperSonics-Thunder franchise has won the most Northwest Division titles, with six, while the Nuggets have won four, the Jazz have won three, the Trail Blazers have won two, and the Timberwolves have never won the Northwest Division title. In the 2009–10 season, all four teams that qualified for the playoffs each had more than 50 wins. The most recent division champion is the Denver Nuggets, having won its fourth division championship in the 2018–2019 NBA season. Robert Leroy Smith (born March 10, 1955) is an American retired basketball player. A 5'11" point guard born in Los Angeles, California and from UNLV, where as a member of the fabled "Hardway Eight" coached by the legendary Jerry Tarkanian, took UNLV to its first ever NCAA Final Four. Smith played for seven NBA teams in as many seasons from 1977 to 1984. He was selected by the Denver Nuggets in the 1977 NBA Draft in the third round. On November 17, 1978, while playing for the Denver Nuggets, Smith scored a career-high 19 points vs the Boston Celtics. Smith currently coaches AAU basketball at the Bill and Lilly Heinrich YMCA in Las Vegas, NV with fellow UNLV teammate and lifelong friend, "Sudden" Sam Smith.